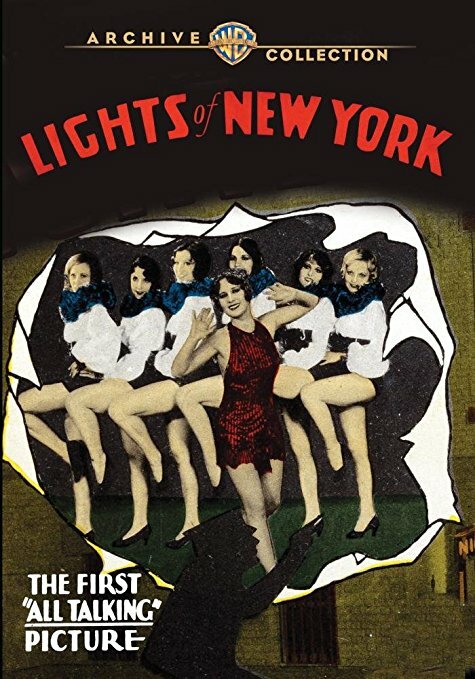 Lights of New York was a huge hit, when it was released in the summer of 1928. Aside from Vitaphone shorts, the “Talkies” had begun in August of 1926, with Don Juan, starring John Barrymore, a silent film with a synchronized score. In October of 1927, Warner upped the ante, with Al Jolson, in The Jazz Singer, a part-talking part-silent production. Ten months later, Lights of New York, marked the technoligical end of the silent cinema, with a production that was wall-to-wall sound. The film is basically a crime drama, and not a very good one. But the import here is fully on the technology, and for that purpose, Lights of New York is one of the most important films ever created. Image quality is quite good, with a nice representation of the gray scale. The main title sequence, and possibly other footage, is cropped on the left side, as it was derived from an element created sound aperture. The image is pleasant dirty, and looks like a 90 year-old film should, when totally unrestored. But again, that’s not the reason to dive into this one. It’s all about history, and the very beginning of the sound era. Aside from Vitaphone shorts, the "Talkies" had begun in August of 1926, with Don Juan, starring John Barrymore, a silent film with a synchronized score. But again, that's not the reason to dive into this one. It's all about history, and the very beginning of the sound era. Guess I'll have to "take it for a ride." A Dawn of Sound Laserdisc Encore to DVD. Speaking of silent films i would like to see one of my favorites The Crowd (1928) released on blu-ray. IIRC – The Laserdisc presentation was an edited version. I've been waiting for this one to be released on DVD. The early talkie transition period (1927-29) holds a certain fascination for me.